GameAnalytics has developed a Roblox SDK for integrating their platform with your games. 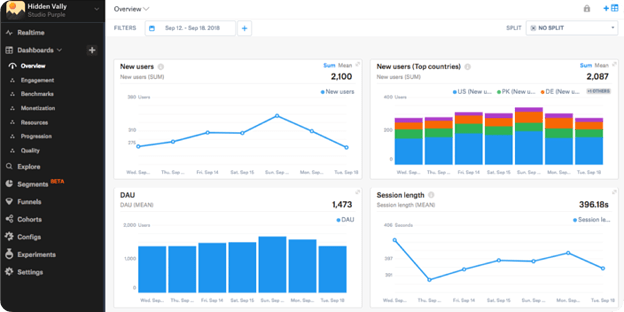 GameAnalytics is a powerful analytics tool that will help you understand player behavior, improve engagement, retain players, and increase monetization. Developers have been talking recently about the advantages of using event-based analytics to help improve your games with a recent series of Analytics articles, starting with an Introduction to Analytics and most recently discussing how to design for engagement. With GameAnalytics supported Roblox SDK, you now have a powerful and easy way to implement analytics in your game. GameAnalytics gives you access to data that you can use to inform your development decisions. If you want to bring your game to the next level, using and understanding event-based analytics is critical. GameAnalytics’s analytical tools and platform allow you to gain insights into player behavior and how your content is performing. For example, you can find out what items sell the best in your game, where new players get confused and stop playing, what content players engage with the most, and more. You can also compare your key metrics against those of over 19,000 games (both Roblox and non-Roblox!) across the platform to understand how well your game is doing. You can set up GameAnalytics for free in just a few short minutes. If you want to check out the platform before integrating it with your own game, there’s a nifty demo game with pre-populated data available when you sign up. The SDK from GameAnalytics can be installed in 3 short steps. Sign up for a free GameAnalytics account and add your game. After you’ve created your game, you’ll find the integration keys in the settings menu (the gear icon) under “Game information.” Copy your Game Key and Secret Key for the following steps. Inside Roblox Studio, right-click on Workspace. Click “Insert from file…” and select the unzipped .rbxmx file. On the GameAnalytics Roblox module page click on the ‘Get’ button. Inside Roblox Studio, select Workspace, open the Toolbox and select My Models. Click on the GameAnalytics module to add it to Workspace. The configuration and initialization steps should be called when your game starts. 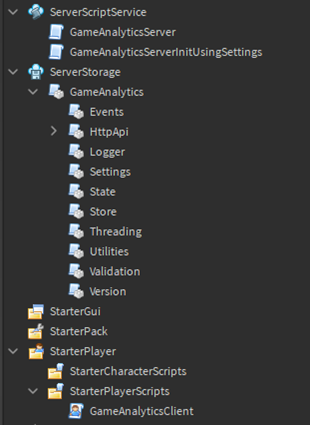 If you want to learn more about configuring and initializing the SDK, GameAnalytics has put together a Roblox SDK guide, which has a ton of details and useful code to help you get started. Once the SDK has been configured and initialized, the final step involves adding events in your game code where some relevant action is happening. Data and Events - what are events and how are they useful? Once you’re all set up, you’ll find insights into more than 50 of the top gaming Key Performance Indicators (KPIs) straight out of the box. Many of these metrics are viewable on a real-time dashboard to get a quick overview of the health of your game throughout the day. Using the dashboards, you’ll be able to get accurate insights into all of your most pressing questions. These dashboards can be customized, so you can see the metrics that matter most to you. You can track real-time player data and behavior with the Real-time feature. This feature is useful for tracking concurrent users and key metrics after updates or during featuring and game events to make sure everything is going smoothly. Using the explore tool you can be as creative as you want with your player data, before customizing the graphs on your dashboards. Select metrics, apply filters, and visualize your results in unique ways that benefit you. Here you’ll be able to accurately target specific groups of players (or segments) by geography, specific player attributes, or by similar behaviors in your game. Funnels allow you to learn how your players are progressing through specific levels or flows in your game and where they falter. Funnel analysis is particularly useful for figuring out issues with your game’s engagement or retention. Use cohorts to see metrics relating to a specific audience and track their changes over time so you can find out how well a particular campaign, promotion, or in-game update is doing. You can find a more detailed overview for each dashboard on the GameAnalytics documentation portal. If you have any questions or problems, feel free to post a reply below. I’ll try my best to help as much as possible. Funny, I was thinking about this just yesterday! Thank you for writing this, I’m using this SDK pretty soon and having this here to guide me helps. I tried to setup GameAnalytics a while back, but there were bugs with the website for me. I contacted their support team and by the day’s end it was fixed and I was able to use it. Are these Top 50 KPIs automatically tracked as soon as you install the SDK? Heya, All top 50 KPI’s are automatically tracked as soon as you have successfully installed the SDK. The SDK also automatically send business events when developer products and game passes (only in-game) are bought. If you would like to manually configure your business events you can disable the automatic events in the settings script. Just a note - this doesn’t look like it’s working by default. Whoever coded it was using a call to require(“Table”) - which obviously errored.